Making an extra effort to image a faint, gigantic corkscrew traced by fast protons and electrons shot out from a mysterious microquasar paid off for a pair of astrophysicists who gained new insights into the beast's inner workings and also resolved a longstanding dispute over the object's distance. 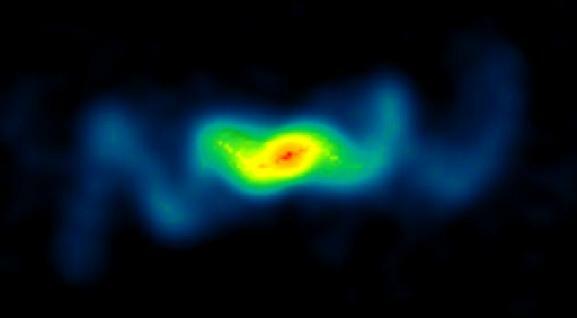 The astrophysicists used the National Science Foundation's Very Large Array (VLA) radio telescope to capture the faintest details yet seen in the plasma jets emerging from the microquasar SS 433, an object once dubbed the "enigma of the century." As a result, they have changed scientists' understanding of the jets and settled the controversy over its distance "beyond all reasonable doubt," they said. SS 433 is a neutron star or black hole orbited by a "normal" companion star. The powerful gravity of the neutron star or black hole draws material from the stellar wind of its companion into an accretion disk of material tightly circling the dense central object prior to being pulled onto it. This disk propels jets of fast protons and electrons outward from its poles at about a quarter of the speed of light. The disk in SS 433 wobbles like a child's top, causing its jets to trace a corkscrew in the sky every 162 days. The new VLA study indicates that the speed of the ejected particles varies over time, contrary to the traditional model for SS 433. "We found that the actual speed varies between 24 percent to 28 percent of light speed, as opposed to staying constant," said Katherine Blundell, of the University of Oxford in the United Kingdom. "Amazingly, the jets going in both directions change their speeds simultaneously, producing identical speeds in both directions at any given time," Blundell added. Blundell worked with Michael Bowler, also of Oxford. The scientists' findings have been accepted by the Astrophysical Journal Letters. Shows Path of Constant-Speed Jets. Note Poor Match of Path to Image. Particle Ejections at Different Speeds. The new VLA image shows two full turns of the jets' corkscrew on both sides of the core. Analyzing the image showed that if material came from the core at a constant speed, the jet paths would not accurately match the details of the image. "By simulating ejections at varying speeds, we were able to produce an exact match to the observed structure," Blundell explained. The scientists first did their match to one of the jets. "We then were stunned to see that the varying speeds that matched the structure of one jet also exactly reproduced the other jet's path," Blundell said. Matching the speeds in the two jets reproduced the observed structure even allowing for the fact that, because one jet is moving more nearly away from us than the other, it takes light longer to reach us from it, she added. The astrophysicists speculate that the changes in ejection speed may be caused by changes in the rate at which material is transferred from the companion star onto the accretion disk. The detailed new VLA image also allowed the astrophysicists to determine that SS 433 is nearly 18,000 light-years distant from Earth. Earlier estimates had the object, in the constellation Aquila, as near as 10,000 light-years. An accurate distance, the scientists said, now allows them to better determine the age of the shell of debris blown out by the supernova explosion that created the dense, compact object in the microquasar. Knowing the distance accurately also allows them to measure the actual brightness of the microquasar's components, and this, they said, improves their understanding of the physical processes at work in the system. The breakthrough image was made using 10 hours of observing time with the VLA in a configuration that maximizes the VLA's ability to see fine detail. 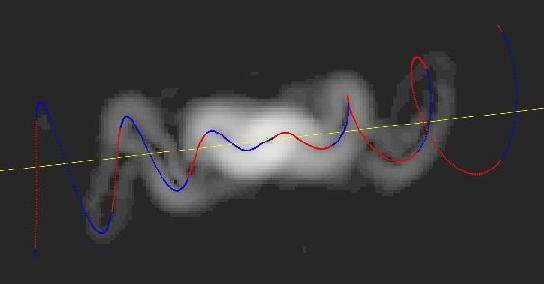 It represents the longest "time exposure" of SS 433 at radio wavelengths, and thus shows the faintest details. It also represents the best such image that can be done with current technology. Because the jets in SS 433 are moving, their image would be "smeared" in a longer observation. In order to see even fainter details in the jets, the astrophysicists must await the greater sensitivity of the Expanded VLA, set to become available in a few years. SS 433 was the first example of what now are termed microquasars, binary systems with either a neutron star or black hole orbited by another star, and emitting jets of material at high speeds. The strange stellar system received a wealth of media coverage in the late 1970s and early 1980s. A 1981 Sky & Telescope article was entitled, "SS 433 -- Enigma of the Century." Because microquasars in our own Milky Way Galaxy are thought to produce their high-speed jets of material through processes similar to those that produce jets from the cores of galaxies, the nearby microquasars serve as a convenient "laboratory" for studying the physics of jets. The microquasars are closer and show changes more quickly than their larger cousins. Katherine Blundell is a University Research Fellow funded by the UK's Royal Society.